The Ho Chi Minh City (HCMC) Department of Science and Technology and the HCMC Department of Information and Communications yesterday jointly held a conference on Artificial Intelligence (AI) research and application in the Period from 2019 – 2025. 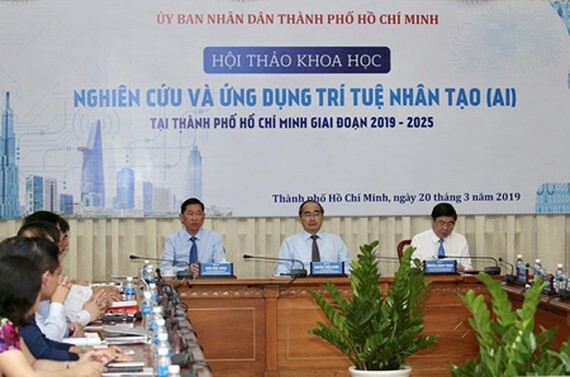 In his opening presentation, Chairman of the HCMC People’s Committee Nguyen Thanh Phong said that the conference aims at clarifying the role of Industry 4.0 in the city’s development plan and raising the awareness of urban leaders in various levels regarding AI implementation to achieve the goals of Instruction No.16 by the Prime Minister on increasing the national capability to approach Industry 4.0. “Scientists, experts, and businesses are expected to use their own knowledge, experience, and research results to aid HCMC in the process of creating and mastering its AI products”, insisted Chairman Phong. Associate Professor Dr. Vu Hai Quan, Vice Principal of the Vietnam National University – HCMC, delivered his speech ‘AI Development from 2020 – 2030: Strategic Vision’, showing his hope to turn HCMC into a data center of the Southeast Asian region in 2030. To achieve this, he stated that it was necessary to form a strategic direction, along with clear targets, financial support, proper policies and legal corridor, preferential programs and AI training investment. Professor Ho Tu Bao from the Vietnam Institute for Advanced Study in Mathematics gave his presentation ‘Opinions about Developing and Applying AI in HCMC’ to indicate that in order to introduce AI successfully, the city needs to build strong infrastructure foundation regarding technology (machines and network), data (connections and sharing), applications (bing data), legal matters, and human resources. Another notable speech was ‘Researching and Implementing AI to Develop HCMC’ by Associate Professor Dr. Tran Minh Triet, Vice Principal of the Vietnam National University HCMC – University of Science. He affirmed that AI possesses high implementation potential in several fields like information security, malware detection, information checking, education aid via virtual reality. It is noticeable that he considered urban citizens as sensors in this smart city rather than just users of devices or specialized equipment integrated into the infrastructure. This is vital to build the database of the city. Secretary of HCMC Party Committee Nguyen Thien Nhan highly appreciated all sincere and practical suggestions from participants. 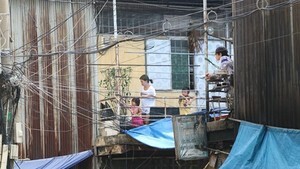 He commented that the city possesses various favorable conditions to build an AI research and implementation center. Therefore, he proposed that the HCMC People’s Committee quickly construct a necessary database on AI experts and organizations while forming a board to manage cooperation or research programs for AI application in HCMC. “HCMC now has sufficient resources to promote the study and implementation of AI into reality”, insisted Mr. Nhan. Taking part in the conference were Chairman of the HCMC People’s Committee Nguyen Thanh Phong, Deputy Chairman of the HCMC People’s Committee Tran Vinh Tuyen, Secretary of HCMC Party Committee Nguyen Thien Nhan, and representatives of the Ministry of Science and Technology, the Ministry of Information and Communications, as well as related state agencies in the city, information technology businesses operating in HCMC.